To accurately predict the distortion of laminated composite parts during manufacture and provide reverse engineered surfaces to create "right first time" tooling LUSAS offers a consultancy service using its specialist LUSAS High Precision Moulding (HPM) software product. By using this service considerable savings can be made in time to market, manufacturing time and costs are less, assembly stresses are lowered, and the time-consuming fitting of any shims is eliminated. During the cure of a composite part residual stresses develop resulting in distortion of the component from its moulded shape. This causes potential difficulties in its use in product assembly. In aircraft airframe applications it is estimated that a high percentage of the costs associated with composite parts occur during the assembly process. This is mainly due to the distortion of individual components and the time associated with the rework and shimming processes required to accommodate these distortions. As an example, an aircraft assembly may require a significant amount of shimming to correct errors due to component distortion. Historically trial and error tooling changes have been carried out in order to try to achieve the desired post-cure part shape but a more accurate and less �hit and miss� method needed to be found. As a result, LUSAS High Precision Moulding software was developed. Data defining the geometry of the composite part and tool is first imported into LUSAS in either IGES or STEP format. Once in, the HPM user interface (which has been designed in collaboration with composite manufacturers), allows tooling engineers to define all aspects of composite layup and cure simulation modelling. 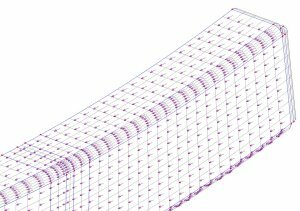 High-performance linear and nonlinear elements are assigned to the model along with boundary conditions, material properties and layup orientation. Temperature profiles and analysis controls must also be specified. Several materials from commercial suppliers are available. In the HPM material database the properties for resins and fibres are stored separately to allow individual selection according to use. Laminate properties are calculated from the resin and fibre data properties using sophisticated micro-mechanics equations. 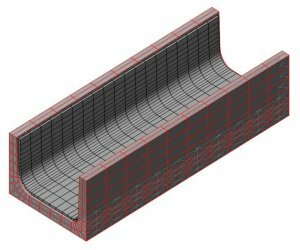 Weave construction details and fibre-volume fraction are also defined via the HPM user interface. LUSAS HPM interfaces with FiberSim, which gives seamless transfer of material information in XML format. Linking of LUSAS HPM with CATIA Composites Design is possible via Simulayt�s Composites Link product. Visualisation of fibre direction and skew angles allows for detailed checking of layup orientation. Nonlinear contact algorithms can model slip and lift off between Part and Tool during cure simulation. A coupled thermal-mechanical analysis is carried out in LUSAS to model thermal curing and calculation of residual stress. The temperature and degree of cure throughout the manufacturing process caused by the internal heat generation during cure is calculated using a transient thermal analysis. This data is then passed to a transient nonlinear stress analysis to compute the deformations due to temperature change and chemical shrinkage. Results are viewed in LUSAS HPM where displacements from the stress analysis can be factored to provide updated tool geometry. 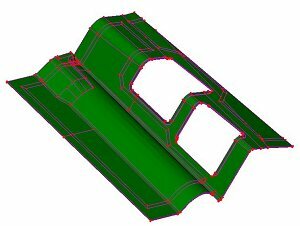 The revised tooling geometry calculated by the LUSAS HPM software can be exported in IGES format for use directly in the CNC tool cutting environment and will, in turn, produce a part that will cure into the correct shape for intended assembly purposes. By using LUSAS HPM software in the design process competent design engineers can now extract master model and tooling surfaces "right first time" ensuring that correctly sized post-cure components are obtained without iterative guesswork. As a result the product development cycle is significantly improved. With the use of accurately calculated master and tooling surfaces it is anticipated that the cost and time required to assemble composite components could be greatly reduced. The ability to build composite components accurately will also enable larger components to be manufactured, reducing the part count and provide further savings in manufacturing costs. The revised tooling geometry calculated by the LUSAS High Precision Moulding software can be exported in IGES format for use directly in the CNC tool cutting environment and will, in turn, produce a part that will cure into the correct shape for intended assembly purposes. 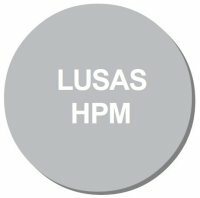 During the course of the development of LUSAS HPM numerous models were created to validate results obtained against manufactured items. LUSAS HPM results for models of C-shaped laminates, exterior panels, cleated curved spars and curved spars with ply-drop off all produced very good correlation with experimental and manufactured test components. 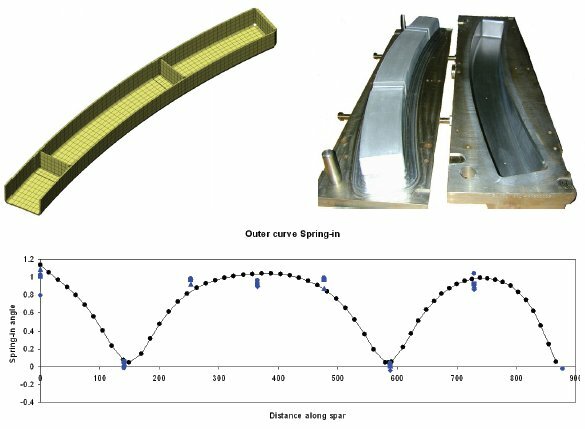 C-Spar model and tooling above spring-in results for outer curve of spar showing good correlation between LUSAS and manufactured part.